It’s always great when automakers show up with some of their heritage models. BMW brought an M1 racecar, and, well, Subaru brought the first four generations of the Forester to introduce the newest one at the New York Auto Show. But they’re cool! And they were a last minute idea. As I blogged about the secret cabin door on the new Volkswagen Atlas Tanoak concept and explained why the Jaguar I-Pace has a functional grille from the press floor of the New York Auto Show yesterday afternoon, I started talking about the cool old Foresters at the Subaru stand with former Jalopnik EIC Matt Hardigree. 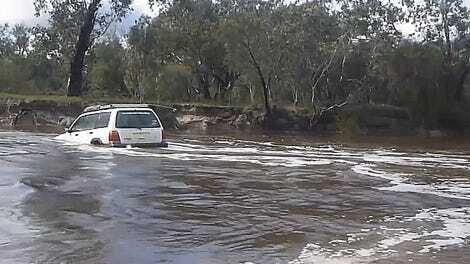 He then tipped me off about the somewhat hasty process Subaru went through to get them here. I jogged over to confirm with Subaru, going through approximately five different people to find out about the four previous-gen Foresters on display. I eventually nailed down that Subaru’s organizers essentially scanned Craigslist for the cars just before the show, rushing to get them in on time. As far as I’m concerned, it was worth it. 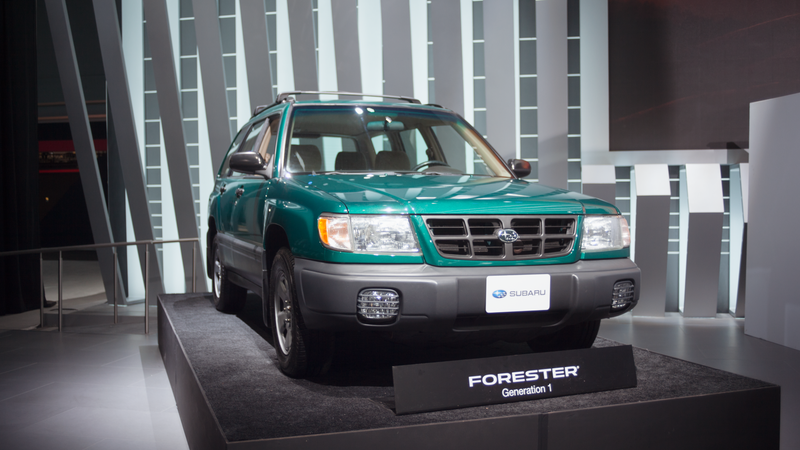 The first-generation Forester on display is a lovely seafoam green metallic, with some slight dents and dings that only added a little more charm, along with the guarded square foglights embedded in the plastic-cladded bumper. On the interior, it also came with some fantastic tan-on-tan quasi-zebra striped cloth. It added some personality the new one just can’t match. The second-generation Forester on the show floor boasted another excellent paint job, this time bright blue. It was automatic, along with every other car on the stand, but that still didn’t distract too much from the adorable vintage AWD badging and good-ol’ bare-bones beige-grey adorned interior we’ve come to miss from Subaru. Alright, maybe that last part is pushing it. The third generation, and the last one I really got a chance to pay attention to, was a last-minute acquisition for the show and Subaru barely had it ready in time. Subaru’s representatives told me they were using a heatgun to remove some unsavory pin-striping from the side yesterday morning, and you could still see the glue residue on the black paint. There was a fourth gen, too. And finally, the 2019 Forester has obviously grown in size compared to the, uh, classics surrounding it. It gets an updated boxer engine with a little more power and a fine-looking Sport trim, but it’s only aesthetics. The biggest question I was seeking to answer yesterday, however, was what Subaru plans to do with these Foresters after the show is over. I had heard that they would sell them off, presumably at auction, but the representatives on the floor told me there were no real plans for the cars just yet, and they would probably tour around various events along with the new Forester. Good. They deserve a happy life in the hands of people who will hopefully care for them.